It’s Halloween! Yay! Candy, costumes, pumpkins and zombies….it doesn’t get much better than that. My favourite part of Halloween is without doubt the pumpkin carving. Having free rein to unleash my meager artistic talents on an unsuspecting vegetable, as well as complete permission to play with my food, well that’s pretty much heaven! It has come to my attention that here in the UK the tradition of roasting the seeds after carving the pumpkin isn’t a standard activity, which makes me sad. Not only is it just a big waste of a delicious and nutritious foodstuff, but it also means that there are millions of children (and child adults like me) who are being denied the opportunity to root around in the pumpkin guts for the seeds, and inevitably chase their siblings around the house with hands full of jack o’ lantern guts. What could be more fun than that? Nothing, that’s what! 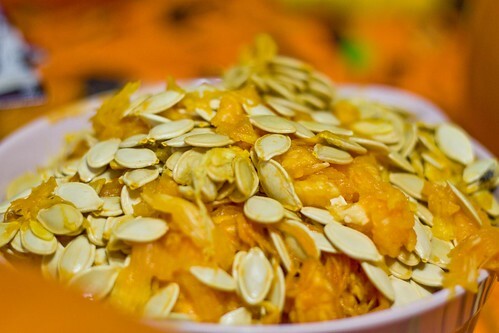 Pumpkin seeds are a great source of zinc and iron, as well as being an antioxidant power house. Roasting the seeds isn’t only fun but also worthwhile, and it really couldn’t be easier. Here’s my recipe (if you can really call it that) for delicious roasted pumpkin seeds. After you pull all the guts out of the pumpkin, sort through and put all of the seeds in a separate bowl. Transfer into a colander and rinse to remove all residual jack o’ lantern innards. Transfer the seeds the a baking sheet, making sure to keep the seeds in a single layer, and either leave to dry for a few minutes or pat dry with some paper towel. 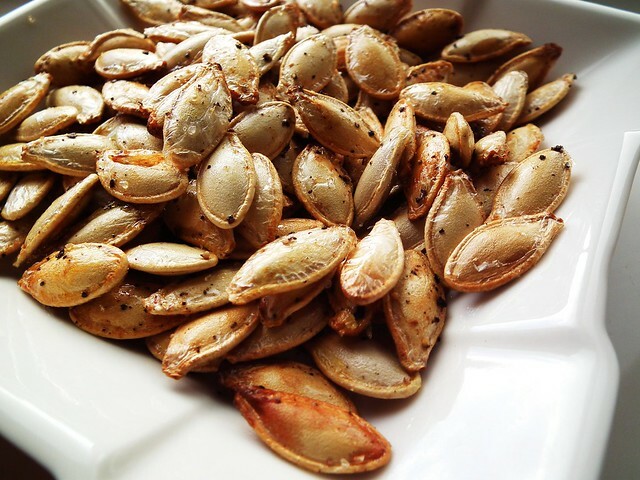 Drizzle the seeds with a bit of olive oil or melted butter (about one tablespoon for the seeds from a small pumpkin) and sprinkle with salt and ground pepper. Place the pan in the oven and let roast for about ten minutes, or until nicely golden. Give the seeds a stir half way through the make sure they are roasting evenly. Remove from the oven, let cool for a few minutes and then eat, eat, eat! I hope everyone has a great Halloween, and just because I love it, here’s a super weird french cartoon from Canada for your viewing pleasure! I couldn’t resist commenting, I absolutely love (LOVE!) pumpkin seeds too! As I’ve gotten older (& due to living in apartments for the last 10 years) I haven’t needed to do the whole “pumpkin thing” but your post is a great reminder of halloween’s past, carving the pumpkin with my dad and then preparing and eating the seeds for a couple days after (the seeds never lasted long around our house)! A pumpkin is always required, apartment or not! I’m glad it brought back good memories 🙂 Happy Halloween!